Sharing your home with a raccoon against your will can be unsettling, to say the least. This happens when wild raccoons find their way inside your building by exposing your homes weak points. 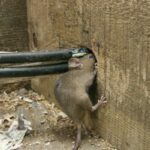 The animals can cause damage to your building as they claw into soffits and insulation and also damage boards and electrical wiring. Raccoons are among the more challenging wildlife animals to handle and this is why expert animal control services are required for thorough and successful raccoon removal from both domestic and commercial spaces. When raccoons get inside they usually occupy the attic. This section of your home is cozy and close to food sources. On top of that, your attic is often the most unused area inside your home. Meaning the raccoon will feel the area is secure from any potential threats, creating an ideal location to build a nest for the kits. Since wild raccoons are not exactly the best houseguests (due to the damage they cause and the health risks the present) you’ll naturally want to get them out of your home once you find out they are inside. Skedaddle Humane Wildlife Control is among the best who can effectively and safely address your raccoon problems. Our wildlife technicians are armed with knowledge and experience in raccoon biology and behaviour which enable us to implement measures that work to get raccoons out and keep them out. As with other wildlife home invasion situations, the Skedaddle raccoon control service starts with a thorough assessment of the building. During this process, the wildlife technicians determine the extent of the invasion. One of the things we try to discover is whether the raccoon in your home may be a mother who is nursing her young. This is very important as mother raccoons are very protective of their kits and may become aggressive if approached without caution. Additionally, the strategy for removing a nursing raccoon will differ from the one used for the typical raccoon. During the assessment, the wildlife technicians also identify the access routes and points that raccoons use to get into your building. We look for clues such as claw marks that are associated with the animals, droppings and fur residue. The assessment results are used to design a treatment plan to get raccoons out of the building and ensure that they do not return. This may include the use of one-way doors (which cannot be used if raccoon kits are left inside). All removal begins with a check for baby raccoons which are then humanely removed and placed outside strategically to ensure their safety and facilitate a reunion with the mother raccoon. This also serves as encouragement for mother raccoons to exit the building (since their instinct will lead them to their babies). To prevent raccoons from returning, Skedaddle’s wildlife technicians will raccoon proof your home by closing off all potential entry points. Of course, this can only be done after confirming that all raccoons have been removed. Building features that open to the outside (such as chimneys and vents) are capped during this phase of the plan. Your Skedaddle wildlife technicians can also offer you some advice on how to change your own habits to eliminate attractions that cause the animals to come to your home. 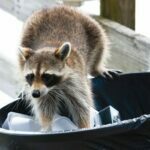 Some of these tips may include storing your garbage and pet food inside and in raccoon proof containers, removing pet food from the outside as soon as your animal companions have finished eating and removing bird feeders from areas that are easily accessed by the animals. Skedaddle’s animal control team is definitely the ideal option for safe and effective raccoon removal from your home.